Perhaps the greatest advantage a business has today is the ability to transcend national borders when hiring. And boy is it true for the software development world. Having managed Messapps and been in the industry for many years now, I’ve noticed that the more successful a company is, the more likely it is to have remote employees. Whether the employees work in different cities or countries, today there’s no need for a company’s developers to commute to a cubicle farm — or worse, commute to a place where free food and ping pong tables are thought to make people happy. I’ll always argue that remote work is better — especially for a software development company. But it isn’t always the easiest. The Ben Parker in me is always whispering: With great remote teams come great responsibilities. But once you experiment and develop some key habits, knowing how to grow with a remote team becomes second nature. In this post I’ll show you the habits engrained in our company’s psyche that help us hire the right people, increase development speed, and improve the quality of our final product – all while fostering a remote work culture. Before getting into our processes at Messapps I want to do some mythbusting. Even today there’s still a stigma about working with remote developers and going remote in general. I find it amazing that, in a world where we send people to space, many think that working with team members outside of your city is a problem. Is there a chance you will work with a bad remote developer? Yes. Is there a chance you will work with a bad in-house developer? Yes. It has nothing to do with where the developer is located. There are great developers all around the world. HackerRank recently published an article that shows how well people from different countries perform on coding tests. China, Russia, and Poland are among the top. The US and UK are ranked #28 and #29. Surprised? Time zone differences can be a problem if you don’t organize your team. If you have ten time zones and everyone works whenever they want, then yes, it’s problematic. On the other hand, different time zones can actually double your productivity. If your time zone differences have a small spread of 4-5 hours, have everyone agree to stay online at the same time. I found that though some developers prefer to work in the early morning and some prefer late nights, it’s usually not a problem for anyone to adjust their timeline by a few hours. If your time zone differences have a spread of 8-10 hours, you can double your productivity and improve client satisfaction. Consider having a day and night crew. Those who are within the smaller spread of 4-5 hours should be online at the same time as you. Those who are more than 6 hours away from you will end up doing some of their work while you’re asleep. And nothing makes our clients happier than knowing they can submit a bug at midnight and have it fixed by the time they wake up. Whether “remote” means working with someone across the street or across the ocean, you must follow certain rules — every day — in order for remote development to work right. Round 1: Complete an online coding test. To test candidates we use HackerRank. This gives us access to a large number of test questions for different coding languages and difficulty levels. These coding tests serve as filters and give us an objective measurement of how much a person knows about app development. Only people who score in the top 10% go to the next round. Round 2: Interview with our CTO, Stas Batururimi. The goal of this round is to see how the candidate analyzes a problem and finds logical solutions for it. To accomplish this, we schedule a Google Hangout call with them and send them materials to read before the interview (here’s an example). The materials are there to help the candidate review some concepts that might have been forgotten but learned before.Once the interview starts, the candidate is given some of the more difficult tasks we’ve faced in our work. The candidate solves the tasks in a Google Docs document so that we can see the thinking behind the solution in real time. Because some of the tasks can be difficult, we don’t always expect the person to find the solution in a given timeframe. We do, however, expect the candidate to demonstrate logical thinking and an understanding of important development concepts. Round 3: Making the decision. If the candidate passes the first two rounds, we know that the person has great development skills and broad coding knowledge. But sometimes even the smartest developers don’t work out. To determine whether they fit our culture, during the third round I interview developers to better understand their goals in life and attitude towards work.The ideal team member must be hardworking, constantly trying to improve, and able to communicate with other team members in a friendly yet informative manner. This interview process helped us hire some of the best remote developers we have on our team. Many practices we follow come from agile principles. The first one is standup meetings. Standup meetings notify everyone on the team about who is working on what and if there are any obstacles being faced. We use the Status Hero bot and Slack for this. What did you do yesterday and were you able to hit your goals? Are there any obstacles impeding your progress? With this daily check-in, we know which projects are being worked on and if there are any issues with them. These updates also let other team members know if someone is waiting on them to finish some part of the project. It’s important to have all the right tools set up for team communication. Your team should be able to easily discuss work-related issues and have a place where they can share a funny video they found on Facebook. We use a mix of two tools for 99% of our communications: Slack and Phabricator. We use Slack for our day-to-day communications. We have channels for each project we work on but also more general channels. For instance, there’s one where our designers can drop interesting design articles they found. There’s also one where developers can share cool code libraries they found. It’s important to add a rule to channels that states that project-related issues should be discussed in their respective channel. This way everyone is aware of what’s happening. It creates a system that makes everyone feel as if they’re sitting in the same room talking. By default, the Backlog aggregates all of the tasks. If there’s an emergency bug fix required or feature we’re falling behind on, we put it into the Priority column. 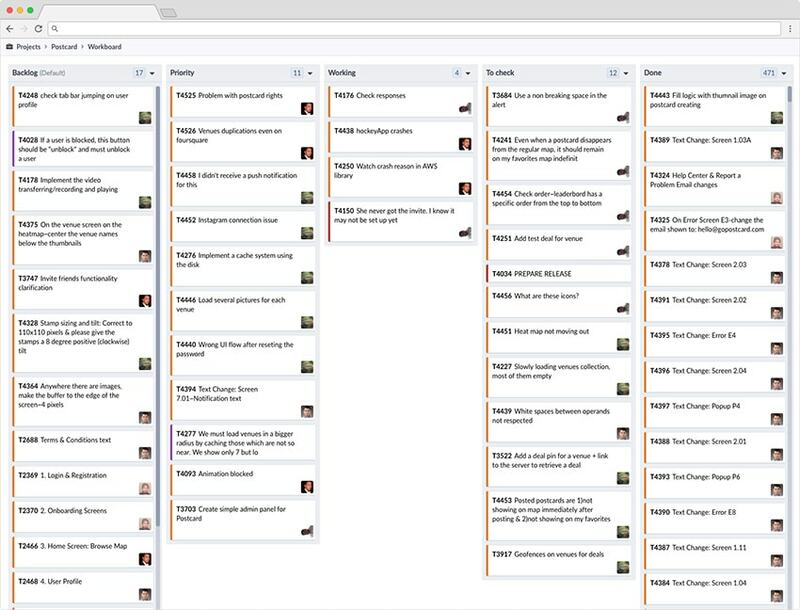 When developers open the board, they first take all the tasks from the top of the Priority column. If it’s empty, they take tasks from the top of the Backlog column. While a developer is working on an issue, that task is placed in the Working column. And as a rule, each developer should not have more than two tasks in the Working column. It’s simply impossible to multitask with finesse. Once a developer finishes the task, it’s moved to the “To check” column. This is where the project manager tests code and confirms the issue is fixed. If the code passes, the task is moved to the Done column. If it doesn’t pass, the project manager leaves comments and moves it back to the Priority column for the developer to fix ASAP. If you’re working with software, bugs are inevitable. But in order to stay on track, you need to separate bugs from suggested changes. Everything a developer needs to fix a bug is here. 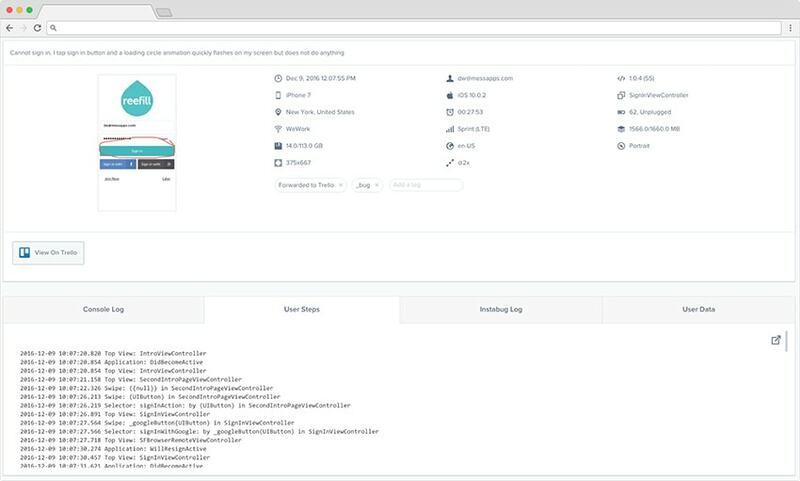 What’s better is that we can easily integrate it with Phabricator. So whenever a bug is reported, it automatically goes to the Backlog and a developer can start fixing it right away. A challenge we’ve faced, however, is clients reporting suggestions as bugs. For example, one can report a “bug” that will say: “Do you think we should change the background color to orange here?” When something like this is reported as a bug, it messes up our whole system. To avoid this there are two options: 1) you can enable the suggestions feature in Instabug which isn’t linked to your workboard or 2) if the bug reporting tool you’re using doesn’t have a suggestions feature, you need to make it clear to the beta users that suggestions should be reported separately. Working with remote developers allows you to hire the best people in the world. They can also make your team twice as productive. To make remote development work, you just need to have the right processes in place. Do you share some of our habits for running a remote team of developers? Or do you do something else entirely? Let me know in the comments. And feel free to email me directly at vm@messapps.com if you have any questions about the work we do. A lawyer by trade, Vasily found his passion in mobile tech and self-taught design/development and founded Messapps, an app development company based in New York. He teaches app development and marketing at New York University and regularly invests in other tech startups. Choosing the right business management software that matches your team’s needs is a work quest on its own. While it may seem like a technical decision only, it’s much more than that. In fact, using the most suitable software for handling your teamwork can have a profound effect on your business productivity and team chemistry….